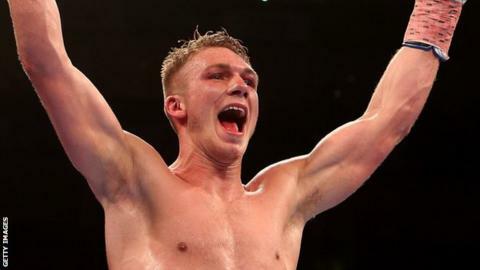 Wiltshire boxer Nick Blackwell, 25, says sparring with world champion James DeGale has boosted his training for Saturday's British middleweight title fight with Lancashire's Jack Arnfield. Blackwell is the defending champion after beating John Ryder in May. "Sparring with someone better than you makes you feel good," he told BBC Wiltshire. "I always make sure my training is going to be harder than the fight, and that's what I've done." On facing Arnfield, Blackwell added: "He's a tall, orthodox fighter. He's going to be awkward." Trainer Gary Lockett said: "The win over John Ryder was a surprise to many but not to myself. "I'm looking for Nick to improve again this weekend. There's no doubt in my mind that he'll have far too much in his locker for Jack Arnfield."